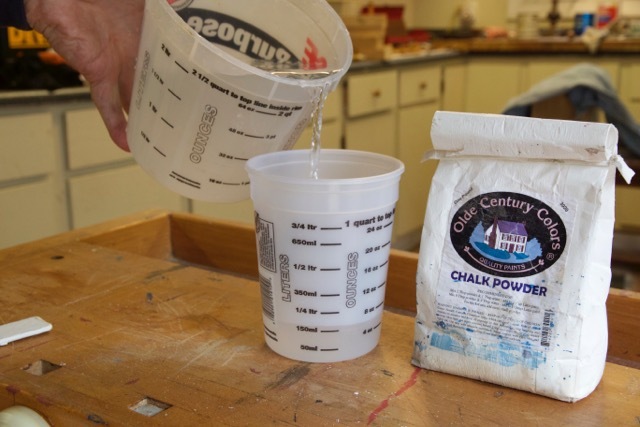 Step 1: Mix two tablespoons of chalk powder with one tablespoon of water in a plastic paint bucket. Stir until the mixture is completely dissolved and smooth. 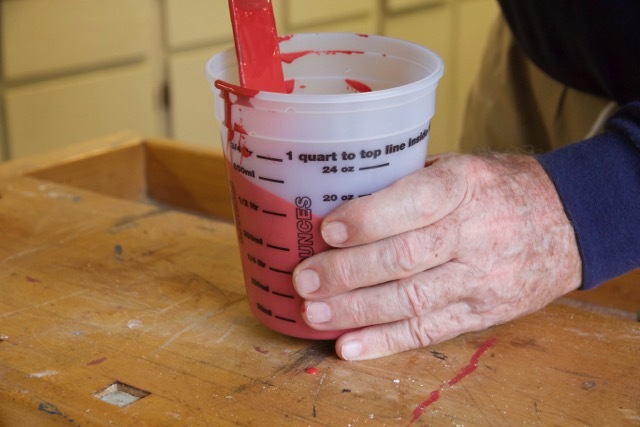 Step 2: Pour one cup or 8 ounces of Olde Century Colors of paint into another one quart plastic bucket. 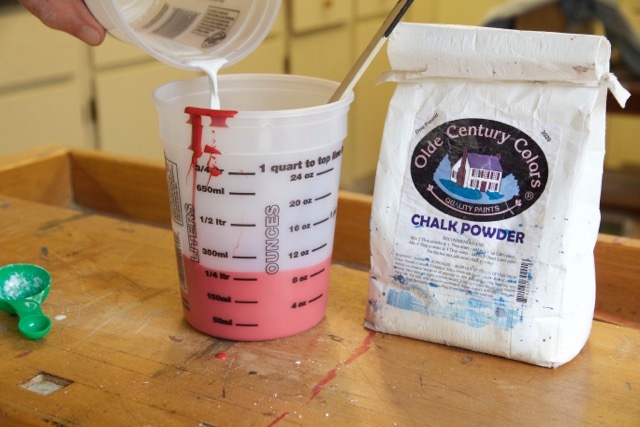 Add the dissolved chalk powder to the paint and stir until the mixture is completely incorporated into the paint. You are now ready to paint a few test boards. Mixing the chalk paint in plastic paint pails/buckets allows for a small quantity of paint without a lot of waste. Do not store chalk paint for reuse. Mix the quantity of paint you think you will use. 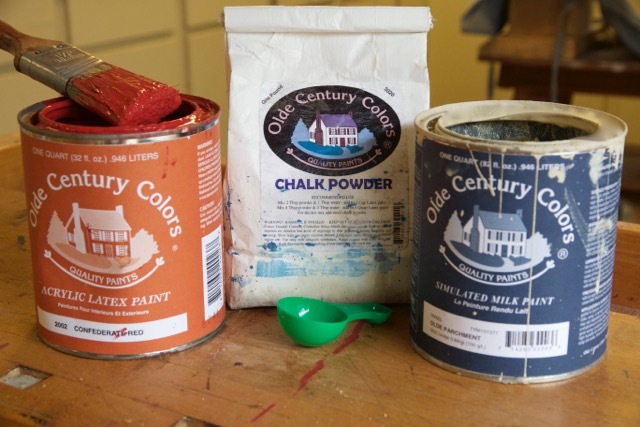 If you wish to have a more chalky feel in your project, you can add more chalk powder and water mixture up to 1/3 cup of chalk powder and 1/3 cup water to one cup or 8 oz of Olde Century Colors paint. Try this recipe after you have experimented with the original formula. Work your way up to what you are looking for. Once you have determined what works best for you, write down the proportion formula and you are on your way to a successful project. Test boards are highly recommended. Follow all of the precautions on the label of the Olde Century Colors Chalk Powder. Looking to buy Olde Century Colors Chalk Powder? Visit our website: Briwax-TRG.com – Buy Olde Century Colors Now. We’ll be happy to send it right out to you! Visit our newly designed website! MORE answers to your frequently asked questions! MORE hints on using the Briwax family of products! MORE examples of using Briwax! MORE videos!! We’ll be introducing some new products, so check back with us often! 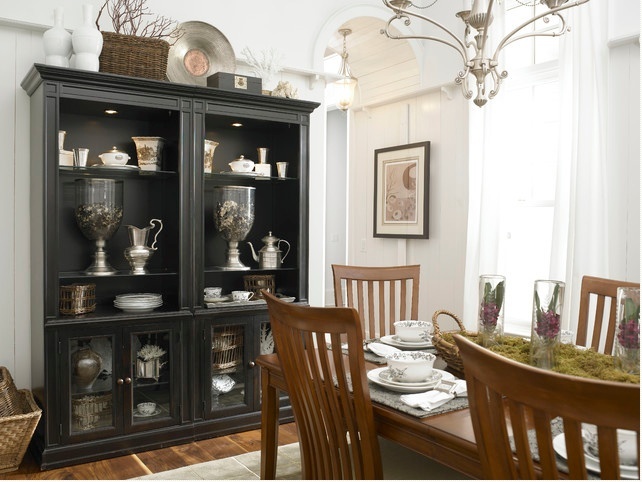 This classic black and white dining room was created by Laura Hardin, Intrigue Interiors in High Point, NC via Houzz. 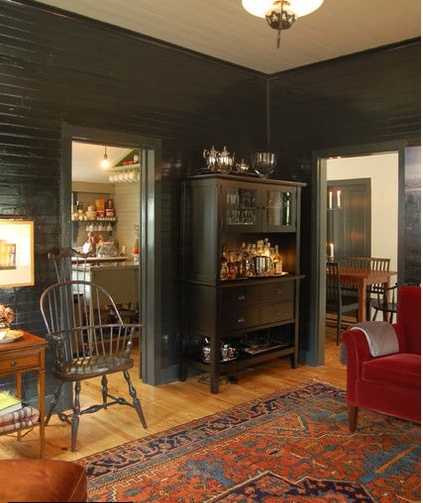 If you have a large piece of furniture, don’t be afraid to paint it black. 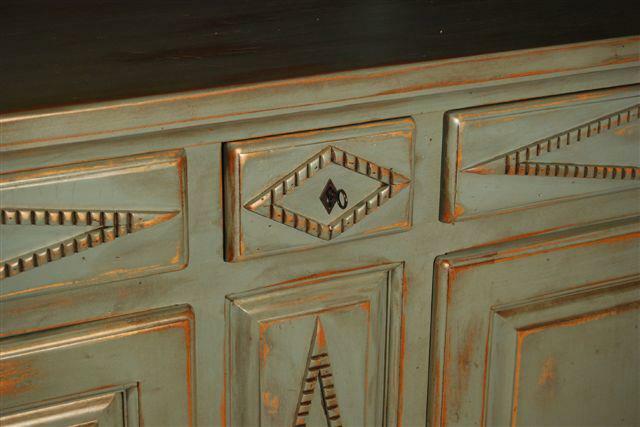 If you like, age the piece by rubbing through some of the paint to shown “worn” areas. An application of Briwax over the paint will give you a lovely sheen and protection for the paint. The neutral wood tones of the dining table and chairs are a lovely addition to the stark colors of the classic black and white. To learn more about Olde Century Colors paints, visit our website: www.Briwax-TRG.com. Black is the color of the night sky, ebony, caviar and coal. It was one of the first colors ever used in human art. It’s classic, deep, simple and elegant. It is also associated with death, fear, mourning and evil. But whatever your associations — from witches to fashion — black is a serious color. As Henri Matisse said, “Black is a force.” And using it in decor is a statement unto itself. It’s confident and self-assured. It’s chic and mysterious. But most of all, black is beautiful. Read the remainder of the article: Color Guide: How to Work With Black. Olde Century Colors has a Lamp Black in Acrylic Latex Paint and Carriable Black in Simulated Milk Colors paints. Either would be perfect for any room. If you want to go really, really dark but not quite black, take a look at these colors: Greenbrier, Olde Navy, Dark Hunter Green, Candleberry Green and Salt Box Blue. 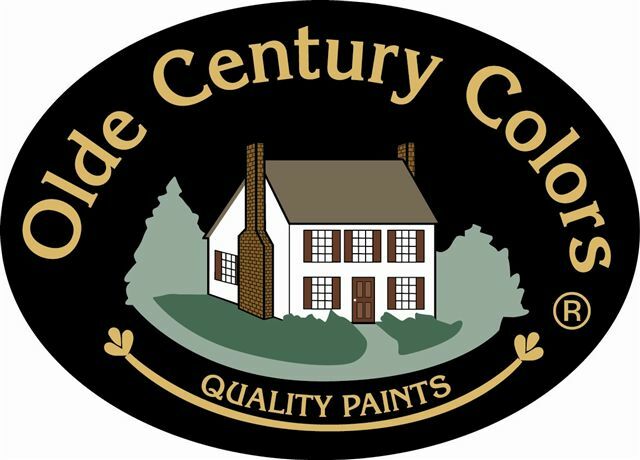 For more information on Olde Century Colors paints, visit our website: www.Briwax-TRG.com. TRG Products ~~ 800/327-4929 ~~ email: TheBriwaxGuy@gmail.com. Both Olde Century Colors Acrylic Latex paint and the Simulated Milk Paints are soap and water clean-up. Both paints can be used as a wash by cutting the paint with water. Additional coats will give more depth of color. Acrylic Latex paints are quick drying, low odor, and non-yellowing. The finish is tough and very washable. Simulated Milk Paints may be intermixed to achieve any color you desire. White to lighten. Black to darken. You’ll be creating your own custom color! Remember that all surfaces must be clean, dry and dull prior to painting! 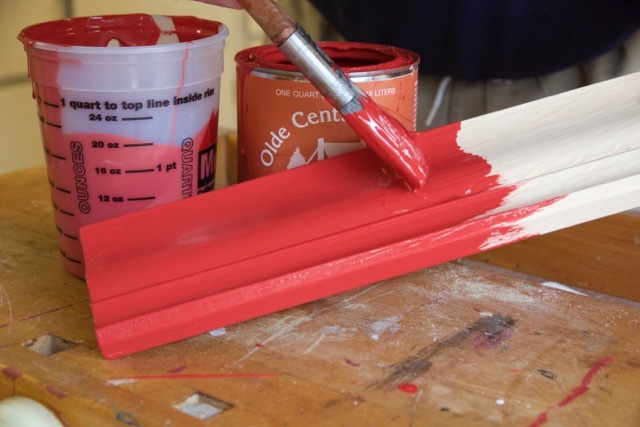 Make sure that your paint has cured prior to applying Briwax over the paint. Where to Buy Olde Century Colors Paints? If you’re ready to buy Olde Century Colors paint but can’t find it in your neighborhood, you can buy directly from us – use this link: Buy Olde Century Colors Paints. Choose from either Acrylic Latex or Simulated Milk Paint — there’s a perfect green for your home.